Small businesses looking to expand can sometimes be discouraged by the cost of launching a new product. Conducting market research and launching marketing campaigns is time-consuming and expensive. But there are cost-effective solutions if you have the right strategy and affordable tools. The United States Small Business Administration recommend putting a face to your customers. This is obviously impossible to physically do in the digital age. The aim therefore is to create profiles of your typical customer. By adopting a small sampling strategy, group customers into segments based on their responses and relevant consumer data they offer. The subsequent benefit of this opens up new markets which you can fill by adapting existing products to meet the needs of your audience. Devising a strategy for product segmentation requires a balance between vital information you want back and a willingness for consumers to respond. Choosing the right channel of communication and making it easy for customers to comment is key. SMS messaging is proven to be the most effective method of receiving feedback. Text messages have a higher open rate and response rate than other marketing channels, and because quick surveys are easy to send from smartphones, customers are more willing to provide feedback or constructive criticism. Although businesses cannot satisfy everybody, launching new products or making variations to existing products enables you to expand your lines and reach out to a broader audience. As a result you can increase market share, improve revenues and reduce costs. The differentiation process is known as segmentation and involves creating groups of customers that have specific needs and abilities that you can fulfil. Market research is simply a study of consumer behavior and product segmentation helps business to understand what motivates customer purchasing decisions. 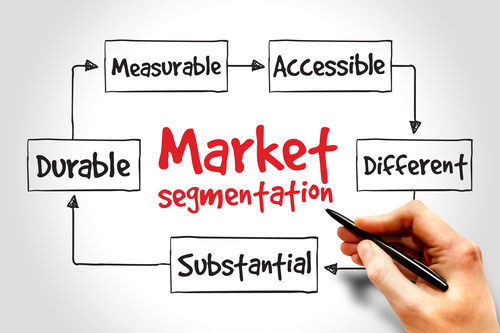 Product segmentation gives you precious insights to what your customers need. You can then model your products to fulfil those needs. The feedback you get from customer surveys can also give you insights of where to position your product. For example, if a food manufacturer receives feedback from customers concerned about product that contain GMO, they know to create a chemical free product and publishing marketing ads in healthy eating magazines and display the product in organic food stores. The underlying purpose of product segmentation is so you can avoid putting all your eggs in the one proverbial basket. Electronics manufacturers for example build products that target budget, mid-range and high-end customers. This strategy gives businesses more flexibility to grow. If one segment is underperforming, profits can invariably be made in other segments. Essentially, it’s easier to sell a range of products than a single item. Customers want a choice. You will find product segmentation in all industries. No matter what size business you have, if you have ambitions to grow, you have to develop new products or services that enable you to span out to a wider audience. The automobile industry is a prime example. Every brand has a set group of customers, but also build a range of cars in relation to the budgets of their target customers. Not every company has to build a budget product if they have earned the prestige to target a wealthier customer base. Another advantage of creating product lines is to determine which products, if any, are not profitable. There may be opportunities to discontinue outdated products in preference of upgraded models that better meet the needs of you customers. Product segmentation therefore becomes an integral part of a companies overall marketing strategy. This however, creates a paradox. On the one hand you want to increase your market share. On the other you need to break down an entire demographic into a smaller market where you are more likely to attract the right type of customer for your brand. The digital sphere gives marketers access to valuable data that can be used to better understand the market. Demographics are the most common approach to market segmentation, but can also be the most misleading. Demographic market segmentation includes age, gender, marital status, occupation, eduction and income. Location can also fall into this category for most products. However, location can impact on specialist products or services. For example, winter coats will sell better in North America than in the warmer climates in the south of the country. Lifestyle is becoming increasingly important in marketing data research. The influence of information on the internet raises people’s awareness of products and services and gives them more of an idea of what they need or would like to do. This has a direct impact on lifestyle choices which has a knock-on effect on purchasing decisions. For example, a company that manufacturers outdoor adventure equipment is more likely to make profits in areas that are in close proximity to mountains, hills and camping sites. Therefore, more marketing spend goes into these areas than say coastal regions where habitants take more of an interest in beach life. Furthermore, outdoor adventurers are a diverse group. There are customers that prefer mountain climbing to hiking whilst others go camping on a regular basis. There are also fitness enthusiasts such as cycling and runners that can benefit from outdoor clothing in cold conditions. Lastly, there is behavioral segmentation. This data give you valuable insights to how customers use your website, what content they engage with and what they are searching for. You can also determine the frequency which customers buy certain products, price sensitivity and the device they use to access your content or browse your website. All this information provides you with information you can use to your advantage. Product segmentation strategies are not only useful in terms of identifying new markets, but also provides valuable insights of the best channels to use to reach your customers. And now more web users are interacting with brands on mobile devices, a mobile strategy is vital. In order to reach your customers with the right message on the right device, you need the right tools and the best creative strategy for relevant channels. SMS messaging services provide small businesses with an affordable and effective solution to reach customers and drive sales. For more information contact JookSMS today. How to group products into segments to open up new markets using SMS messages.